I just got braces put on my teeth a few weeks ago to correct a bite problem. I’m going to be stuck with them for about 24 months. Already, it is starting to bug the crap out of me. It’s no fun at all, especially since I am a full-grown adult and not a teenager in high school. Normally, I don’t even think about such mundane things as teeth, but because my braces have caused me to focus on them ALL THE TIME, they are never far from my mind, partly because they are uncomfortable and partly because I am not used to them yet. This then leads me to think about teeth and how the Vietnamese women in earlier times used to care for them. If I had been born just 100 years earlier, my family would have blackened my teeth once I hit puberty. 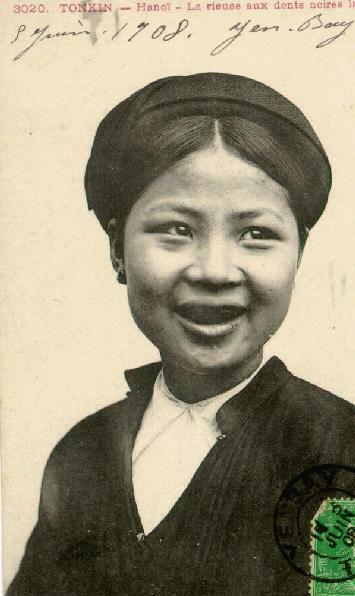 This is an image of a woman with dyed black teeth from north Vietnam circa 1900. That’s roughly a bit over 100 years ago. It may not look like it now, but back then, it was all the rage. There were two main reasons for the black teeth. 1. It was a very effective teeth bonding procedure which kept the teeth from getting carries. My grandmother kept every single one of her blackened teeth, up till the day she died. According to studies done by scientists*, fresh soot of certain trees, when applied to the teeth as a dye, would inhibited the growth of salivary mutans streptococci and prevent dental carries. The women who had their teeth blackened in this manner kept all their teeth throughout their lives, and given the fact that dentists were nonexistent in those days, the idea of keeping one’s teeth into old age was something that had to have been a great alternative to having teeth rot out of their mouths. Ancient human remains showed skeletons with black-dyed teeth, complete and full, with no damage even after all those years. That’s amazing! 2. Since most South-East-Asians looked the same, it was hard to tell the difference between a Vietnamese person and a Chinese person living in the same community. The only way to know was to look at the females when they smiled. If they had white teeth, they were Chinese. If they had black teeth, they were Vietnamese. Intentional dying of the teeth by Viet women was used to differentiate and retain the customs of the Vietnamese culture. It was also to keep the guys interested. Viet guys only wanted girls who had black teeth because they thought it looked HOT!!! It was great! The girls got to keep all their teeth, AND it also kept the guys from getting confused as to which girl to go out with. I’d say that was a win-win situation. And then I think to myself, this is not a natural color either. Europeans call this ‘American Teeth’, as this color does not occur naturally in human teeth of any race or ethnicity. It can only be obtained through deliberate dyeing or bleaching of the teeth. In any case, dyeing teeth black is an ancient tradition that is no longer followed. The only ones left around who still have dyed black teeth are women approaching the centennial mark. However, it is a notable northern Vietnamese tradition so I thought I’d mention it, along with a recipe, just in case someone wanted to try it out. 1. Thoroughly clean teeth with powdered coal mixed with salt. Do not eat anything solid or hot at any time during the process. 2. Hold pieces of lemon in the mouth and drink rice wine mixed with lemon juice to eroded the enamel and create pits in teeth to allow for better adherence of the dye. Do this for three days. Caution: This may caused soreness and swelling of the lips, tongue, and gums. 3. Apply shellac and lemon juice using a cloth soaked with this mixture. Keep it on the teeth over several days and nights without taking it out. This will turned the teeth a dark red color. 4. Apply a solution of iron or copper filings which will react with the shellac and turn it black. 5. Add extra shine by rubbing soot from burnt coconut shells. And just to add a bit of culture to this post, here is an ancient poem called the Ten Loves which talks about the black dyed teeth of the Viet ladies. It was adapted several times as different folk songs. Here is one version. * Black teeth: beauty or caries prevention?. WHO Collaborating Centre, Faculty of Odontology, University of Malmo, Malmo, Sweden. Wow! Never would’ve thunk it! This custom is very interesting! LOL. It certainly is a novel way to bring a very old custom back into vogue. You never know…the underground fashion might latch onto it, especially the goths and emos. Maybe you can try out that business, if you have the right underground connections.